There are certain moments in life which require getting everyone together for a bit of a party. It might be a family celebration, a reunion with friends or a special birthday or anniversary. Why not gather everyone under one roof and enjoy time together in one of our large self catering properties? We have more than ten properties that are suitable for bigger parties, so there are plenty of options to choose from. Read on to find out more about our holiday homes in Cornwall for large groups. 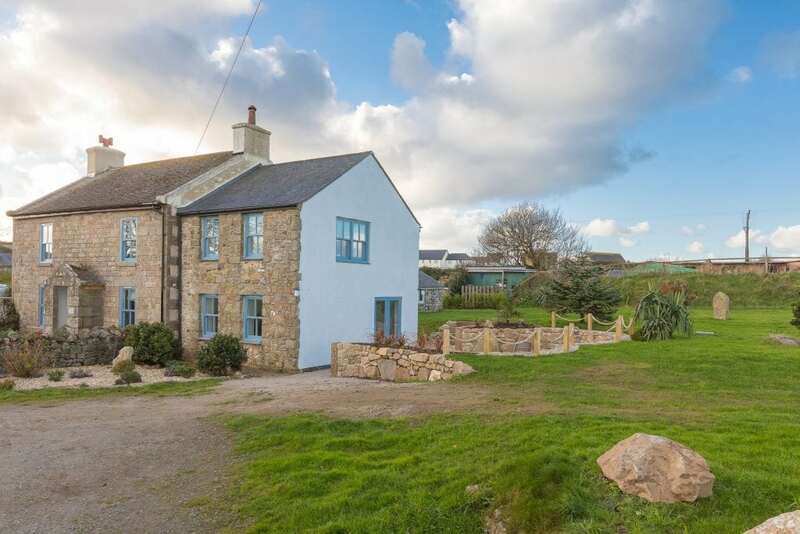 If you’re planning a cosy Cornish winter break or a multi generational summer holiday, Corva Farmhouse could be a great choice. Situated on a quiet lane in St Ives, this fantastic cottage is dog friendly, has 4 bedrooms and 3 bathrooms. From this spacious rural cottage, you can gaze out across the countryside, with far reaching views that go all the way to the sea. Have a BBQ in the large garden or relax in front of the wood burner with your nearest and dearest. You might also want to check out Glenside House which has a charming writer’s room, a Lion, the Witch and the Wardrobe style wardrobe and a large garden with spectacular sea views. If an ocean view Penthouse is more your style, our Blue Vista apartment could be just what you’ve been searching for. 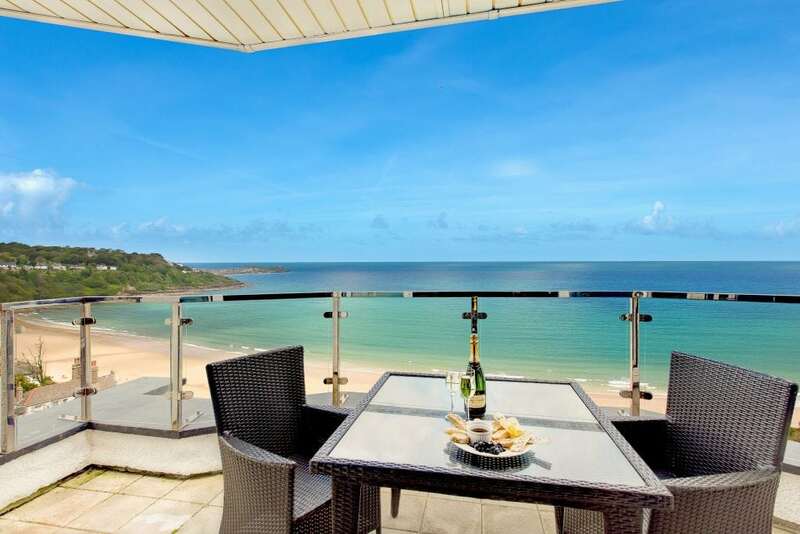 You can enjoy panoramic views of St Ives Bay from the balcony, ideal for enjoying a special meal with family friends. If you don’t fancy cooking, you can always ask us about hiring a private chef for the evening. This gorgeous seafront penthouse is just a short stroll from the beach and close to the south west coast path and golf course. It’s the perfect location to escape from it all with your loved ones. If you like the look of Blue Vista, you might also want to view Fairsky which is another luxury penthouse retreat which has sea views from the open plan living area, kitchen and all the bedrooms. 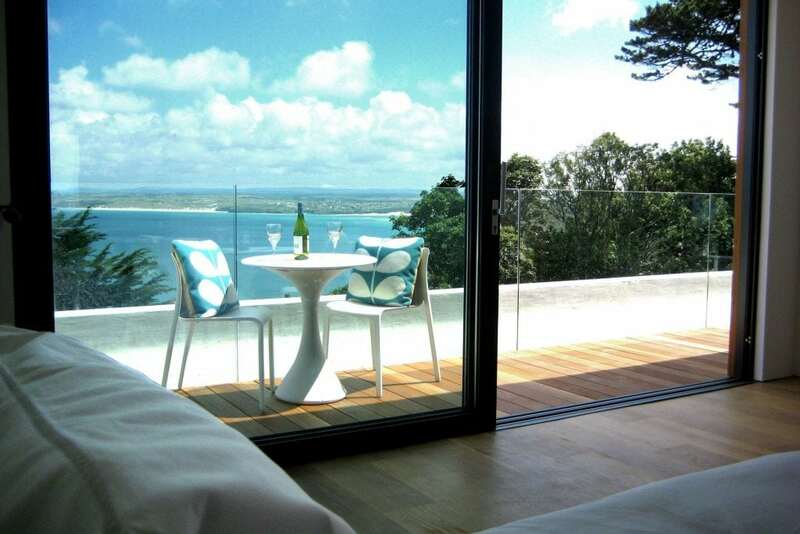 Looking for luxury holiday homes in Cornwall for large groups? 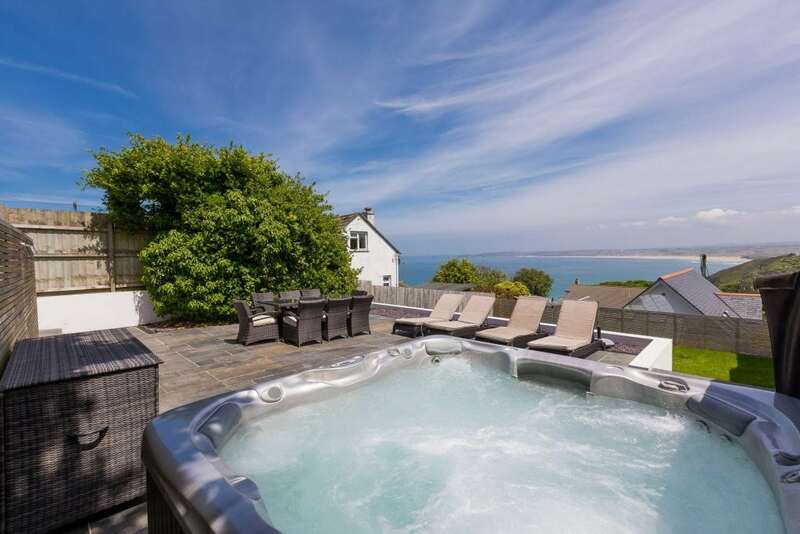 Fernhill Lodge is a gorgeous sea view apartment with an 8 seater hot tub, making it an ideal luxury retreat for a reunion with friends, a fun New Year’s Eve break or a luxury summer escape. The property is built in reverse, with the living areas at the top to make the most of the views. With such a spacious covered balcony and enclosed garden to relax in, you’ll hardly need to leave the apartment! However, the gorgeous sandy beach of Carbis Bay is only a short walk away. 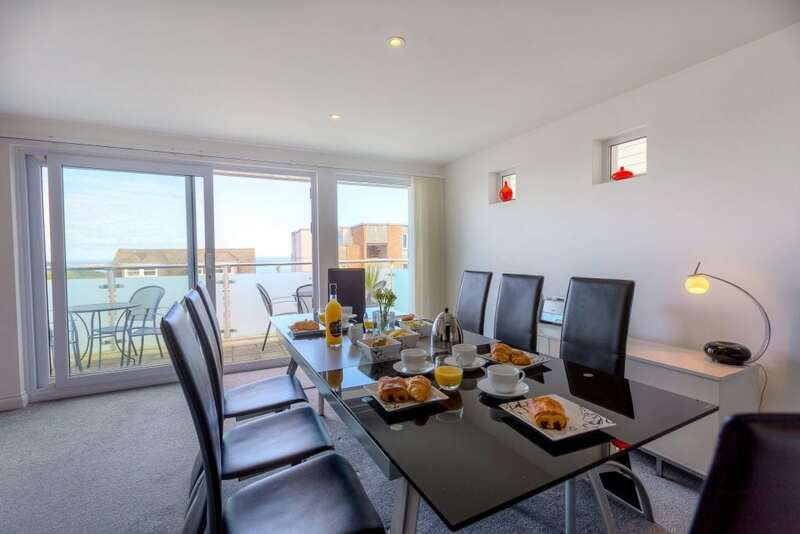 If you love the sound of this luxurious holiday home, make sure you also take a look at Whitsunday House which is perched on the Cornish cliff top providing elevated sea views. Imagine moving your house to a stunning location by the sea. A stay at Chapel View provides you with all the comforts of home but in a seaside setting. You can walk down to the beach within five minutes, there’s plenty of space arranged over three floors and lots of outdoor seating and balcony areas. Alternatively, Sea Dream is a granite house in a central location in St Ives, ideal for exploring the gift shops and boutiques and enjoying the restaurants, pubs and bars. The cosy holiday property has all the comforts from home including a wood burner, an outdoor terrace and comfy, light and airy living areas. Most of our holiday homes in Cornwall for large groups have 4 bedrooms and sleep up to 8 adults, but Salt House sleeps up to 10 adults. The property has beautiful and spacious open plan living areas with stunning sea views. The floor to ceiling glazed doors make up the entire seaward wall of the house, enabling you to enjoy the panoramic ocean views from all angles. This fantastic property has 5 bedrooms and 4 bedrooms, over 3,500 sq. ft of living accommodation, a cosy snug to retreat to and is a short walk to the white sandy beaches of St Ives and Carbis Bay. This seaside escape makes a special treat for all the family. Excited to plan an unforgettable holiday for you and your loved ones? View all of our holiday homes in Cornwall for large groups and start planning a holiday to remember.